Over the last 3 weeks radio presenter Vic Morgen has been covered by my personal favorite presenter David Sheppard. He is a fellow bus spotter and is very willing to have a little chat about buses on his show between 10pm and 1am on BBC Radio Devon. Well worth a listen. He also owns a bus which I will post on which one it is soon! Unless anyone knows better which they probably do! Picture of the X80 as he told the listeners about a very interesting expierience on the X80 he had on Friday. The first word came to be on Saturday on my trip upto Exeter and Taunton with Louis. As there was very few things of interest on this trip I thought I'd bypass it and consentrate on the interesting bit of the weekend. When we were waiting for a train in Exeter we had a call from friend Mike Hudson. He advised us that C409 HJN was up for sale and was aparently only £450. 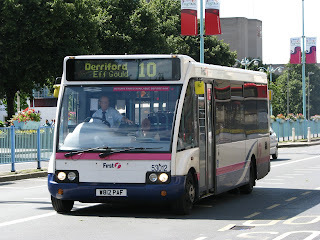 As you know I am very parcial to a Leyland Olympian and have always wanted to own one of the Torpoint Olympians. 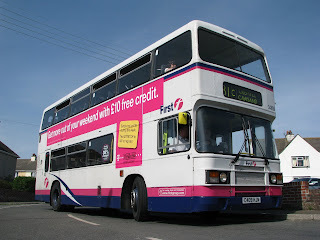 These were this one and C412 HJN being my other favorite though to my knowledge this one was a much more reliable bus. So this led me straight onto e-mailing a few contacts that evening. These included and couple of employees of FDC and FDC themselves to see what would result and how I could purchase it. Simon Coates replied on Sunday morning advising me of a man to contact. He also said he would find out as much information as possible so was a fantastic help. As I was doing this bad news was to find its way into my inbox. C409 HJN had been withdrawn not because it was old but because of a corroded chassis which was getting very fragile. A great shame seeing this bus was the best mechanically, had a very good interior and had a new engine fitted only around 7 months previous. SO sadly this meant I wouldn't be a bus owner at the age of 14. However much I would love to own C409 HJN I hate to think how difficult and expensive it would be to try and rectify a problem like this. Derrick Cuff has told me that he has shown interest in the bus though so there may be a life for her yet. PTOTPA will keep you updated on what happens to her in the near future. But my sights are now set on C412 HJN. Question now is, how long will the rest last at Torpoint? Over the past couple of days I have had very little news to report on! Though Saturday will see a trip to Exeter and Taunton so hopefully some things of interest will be seen there! http://www.youtube.com/watch?v=nDstEWZwBxY - This video showcases what PTOTPA has to offer including buses, ferries and trains in the area. http://www.youtube.com/watch?v=-ZJ-ExCO3Zs - This video showcases events that have been visited and will report on in the coming future including Penzance, Weymouth, Kingsbridge, Westpoint and Bristol. Many more should be enjoyed in the near future. Comments are welcome on all of these videos. I hope you enjoy them! More will come soon and you will be notified of this through the blog! My 200th post was actually the last one but I didn't realise so we shall comemorate 200 posts on this blog! I have also commemorated it by making a brand new promotional video now avalible on the link below. Hope you enjoy it! Today saw the final EVER PCV driving day for the legend that is Mr Derrick Cuff. His last day saw him working for A-Line Travel on the 80s to St Germans, Trago and the evening runs to Cremyll. 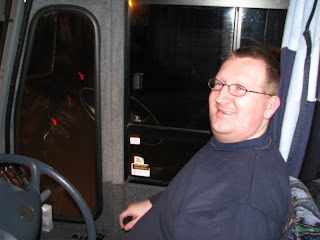 He has worked on the buses for a decade now working for several different bus companies along the way including First Devon and Cornwall, Target Travel, Carmel Coaches, DAC, and I'm sure a few others along the way. 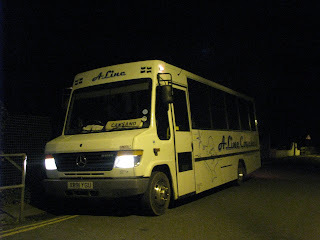 But now he has finished his PCV carear at local company A-Line Travel driving Mercedes Vario X891 YGU. Not the nicest bus to finish your carear in, but what a brilliant route to leave on. Where it all started was at Torpoint and Plymouth depots and therefore seems very fitting for his last day to be on part of the old 81B route. Derrick is now moving on to being a train station cleaner across the south west between Penzance and Weston Super Mare, so look out for him! You might just see him cleaning your local station. He will also be covering the branch lines so it is a very wide area to cover! Good luck to him in his new job. But it will never be the same without "CUFFY!" around. Louis and I took a trip into Plymouth station today for most of the day. Though the most exciting bit was nearer the end of the day. Around 10 train spotters turned up to witness DRS's Class 37, 37605 pull into Plymouth from its trip all the way from Derby. The beast even arrived 30 minutes early so none of us were ready when she roled not so gracfully into Plymouth. More astonishing was that she was 7 minutes late to start with. Show how good these old girls still are! PLYMOUTH (Dock 4) arrive 23:53. She will leave Plymouth on Thursday for her run back up the country. I will try to find out timings for you if possible. 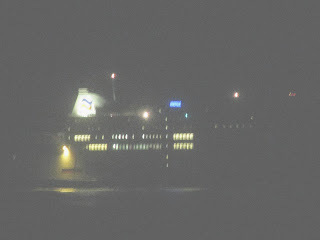 On return home from todays events which I will post about later we boarded the ferry as normal. Though as we pulled into position: WHAT! that Trident is facing the wrong way! There was then after looking properly also a First Support Van on the ferry facing the wrong way! The fitter was underneath the bus at the time with driver Eddy watching as he worked. He attempted to start it up on the crossing though it failed. So I'm not sure how many journies back and forth it made. What I wonder is did it have to pay each time!! More to come on the days events shortly. Brittany Ferries' new ship Arrives! Sorry for the lack of posting this week. This is due to it being the last week of term and a lot of coursework etc has had to be handed in. So with a quiet week forthcoming hopefully it will bring plenty of posting! SO as promised and right on time Brittany Ferries' new ship MV Amorique has started operation on the Plymouth to Roscoff route. This began on February 10th and the picture shown is of her on her maiden voyage. She did leave late as the crew are not yet fully acquainted with their new vessel though the boat apparently set a new record of time for this journey. Though I know this to be wrong as the high speed Catamaran has done it much faster than this. This ship is very modern and high tech inside and looks cutting edge from the outside. I lot of time, effort and money looks like it has gone into the ship and I am sure that she'll be good to us for many years in the future. Hopefully a better picture can be posted soon taken in the daylight though I had to try and take a picture on her maiden voyage however bad the quality may be! Today saw myself and Louis Rawlings take a trip down to the capital of Cornwall, Truro. Though as usual living where I do the fun started far before we got to Truro! I caught the 8:45 81C from Cawsand which was due into Plymouth Rail Station at 9:51, 7 minutes before the train down to Truro. Though this started off badly. The bus turned up at 8:54 because of a lorry blocking the road in Millbrook which was not the best of starts. 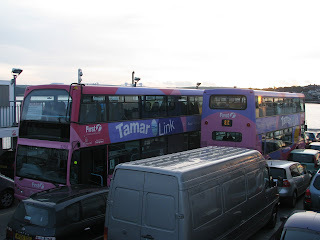 Though by the time we got to the Torpoint ferry we were on time. Though what wasn't expected was the ferry leaving 5 minutes late. That meant we arrived in Devon late. This was then not helped at all by roadworks on Stoke hill and I was starting to get worried. People joining the bus in Stoke delayed us further and we arrived at the station at 9:55, 4 minutes late. I met Louis and we rushed into the Station. Darting towards the fast ticket machine we saw it was out of use. We then went straight to a booth where the ticket buying process was very swift. We then ran out towards the Platforms with the aid of the nice ticket barrier man. 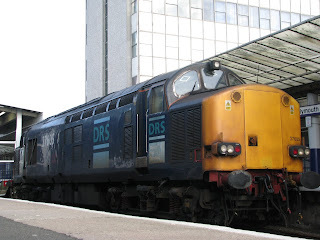 From across at Platform 3 came a cry "Do you want the Penzance train" we shouted "Yes please!" So thanks to the very nice train dispatcher we made the train. Without him we would have had no hope so thank you very much! 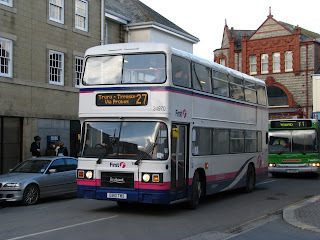 When we reached Truro we had the aim or trying to track down 2 ex-Torpoint buses. These being 30065 which left the depot a while ago now and also 34809 which has left during the course of this week. 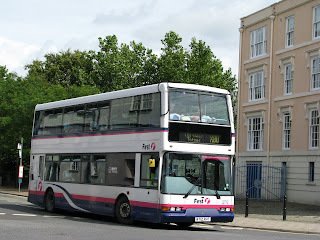 The trip into Truro Centre was made on one of the 56 reg Volvo B7s. When we got to the Bus Station we were simpley inundated with Darts, and 1 B7. Pretty boring considering the amount of G reg Olympians we saw last time along with some Alexander Royale Olympians. Though when G905TWS turned up we jumped at the chance of a ride to St Austall. This was a very enjoyable and fast ride, the Olympian ran very well. ON the journey we also spotted Western Greyhound's brand new 58 reg Optare Solo (older style). Sadly we didn't get a picture though. On return we went and got a quick pasty and then did a bit of spotting. A couple more example of G reg Olympian turned up though again 30065 failed to show as it didn't last time aswell, along with 34809. A great shame! Though this did make me think. 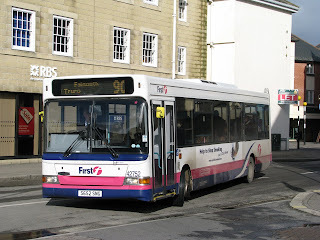 Why if Torpoint's buses are being transferred to there are they not using them?And therefore why does Torpoint therefore get left with no spare buses at all. We have even got 2 on loan from Plymouth depot in the form of Varios 52519 and 52559 (I think). 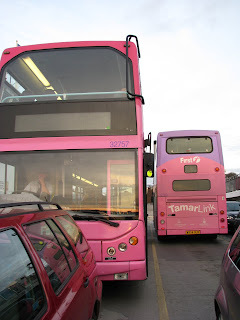 Why not send these buses back here if they are not in use down there! The Vario's can't cope with volume and after the withdrawal/suspension of 50306 and 50301 also needing a major overhaul things are set to get worse. 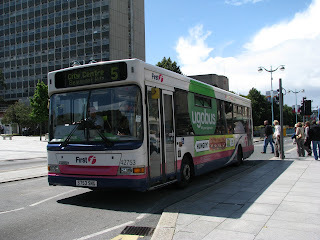 Tridents are also starting to gather problems thick and fast and this again leads me to Torpoint really needing its maintenance facilities and staff which I'm sure would help with some of these problems. 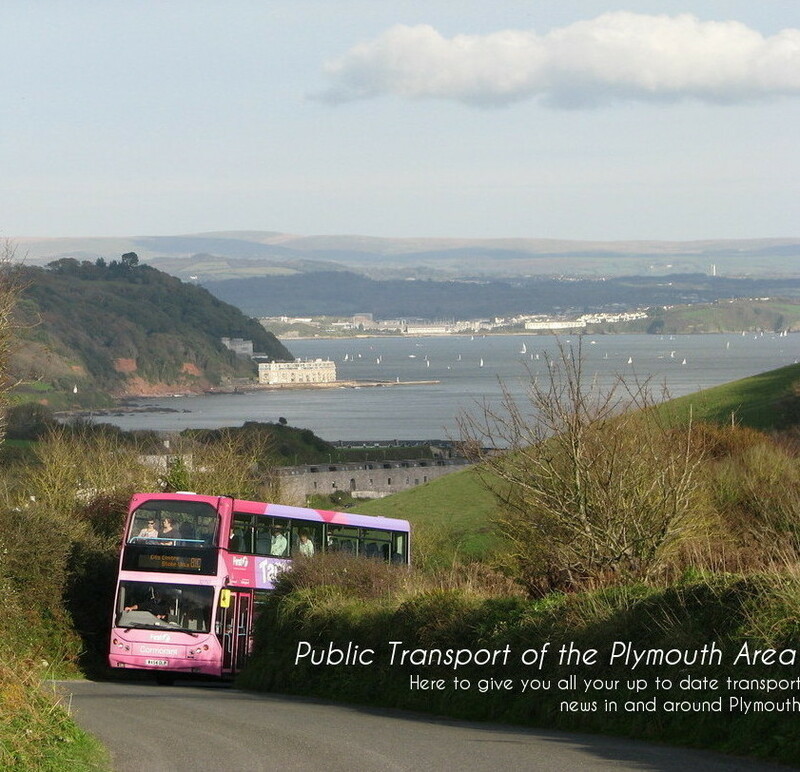 Today at around 11:30 Ex-London Dennis Trident 32812 was in a fatal accident on route from Dartmouth to Plymouth. I will leave the Hearld and BBC to explain it to you on the links below. The bus is pictured above still in tact just 4 days before the crash. Though it was a while ago I though I had to do a blog on this bit! Well the fifth part of the day was to take a trip on the 11 with bus driver Paul Revell. Though the first event of this part was on Royal Parade! While waiting for the 11 talking to Paul and Louis the 11 came in behind me, mounted the curb and hit me! Was not bad but if I had been an elderly person etc something much more serious could have happened! So we joined Paul and went round on 2 rotations in Dennis Dart 42753 (S753 SNG). Though when we boarded the bus the centre console had copalped so we could see no warning lights. ON the second rotation coming down past Toys R Us we went over a small pot hole in the road, the dash colapsed further and a warning alarm came on! We stopped the bus before Royal Parade to inspect the bus. The emergency door was fine there was no fire so the problem was not found. After resetting the system the alarm still went off. 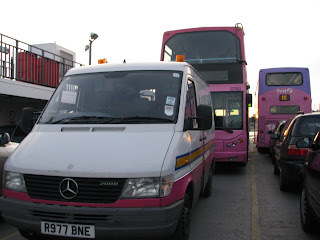 We drove the bus upto Royal Parade to let teh passengers off and radioed control. They told us to do checks we had already done again and this again resulted in no luck. 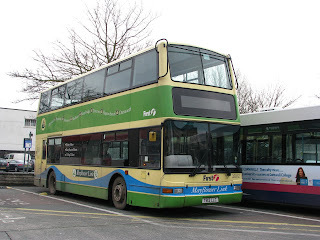 After around 15mins they told us to take the bus down to Bretonside and to swap it with Optare Solo 53012. This we did, though as there were no spacing this meant leaving the Dart in the road to get the Solo out, then to get back in the Dart, park the dart and get back in the Solo. We then rushed upto Royal Parade where the 11 behind us had already left and Paul drove to make up time. By the 4th rotation he had caught up all the 20mins lost and booked off duty on time! What fun a bus driver can have!